I am a dreamer; I dream of the day where every human being has access to clean water. I depict children waiting in line for unclean water when what is needed is a water line that pumps in clean water. As I think about the water and the lack thereof, I am forced to think of the many women and children who go without. Those thoughts compel me to create work encouraging world change. With my artwork, I tell stories that live deep inside of me. The need for clean water is something we should all pay close attention to. I hope my artwork stirs up something on the inside of each person who views it. I hope is stirs up change in the world’s water situation. There is no shame in not having what you need; the shame is seeing the needs of the less fortunate and doing nothing about it. Let’s do something! 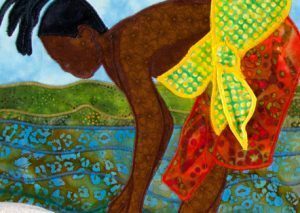 Phyllis Stephens is an award-winning fifth generation quilt maker, considered by critics to be a Master of African-American Story Quilts. Simply stated her quilts are inspirational. She has quilted professionally for over 30 years. Raised in Bloomfield, Connecticut, she is a graduate of Boston University. 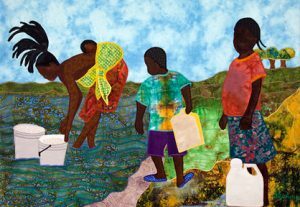 Her quilts have been displayed in the most prestigious museums, institutions and galleries in the world, such as The Museum of the American Quilter’s Society in Paducah, Kentucky; the Fine Art Museum of Ghana, Ghana, Africa; and Lincoln Center in New York, New York. Over the years Ms. Stephens has displayed her works in continents and countries across the globe; Africa, Italy, France, and Greece to name a few. For more information, please visit her website, http://phyllisstephensart.com.